Cheryl had her chair, her computer, and her med cart. Everyone in the ICU knew this; even the physicians, who wouldn’t dare sit in Cheryl’s chair and use her computer if she was in sight. One night, Liz, one of the newer nurses, sat in Cheryl’s chair to document on her patient – on Cheryl’s computer. One of the techs warned her, “You had better not let Cheryl see you sitting in her chair.” But Liz ignored him. Cheryl threw a cup of water at Liz. Some people are extremely territorial at work. I’ve frequently heard stories, like the one with Cheryl, from healthcare leaders, nurses, physicians, and support staff about how one of their coworkers marks their territory, be it a piece of equipment, a chair, or a particular area within the department. One nurse identified her area in the clinic by placing thick tape on the floor to designate her spot. A unit secretary wouldn’t share her stapler, post it notes, or telephone with anyone other than the nurses she liked. A nurse arrived a few minutes early for her shift, had a computer set up and her things already on it. About a half hour into the shift a senior nurse showed up late and took her computer and yelled that she has been there for that many more years before her and just took her computer. One of the most tenured nurses on a unit places a taped piece of paper over a computer screen and flips the keyboard over. If you use her computer she will tell you to get off. She’s doesn’t care who you are including RN peers, residents, fellows, attending physicians, etc. She even tells her leaders this. After all, that’s “her” computer. Not only are nurses territorial when it comes to their equipment, being territorial shows up in other ways. Some people hide thermometers, IV pumps, mobile BP machine, linens, medication scanners, so they are available for them when they need them. Some nurses claim “their” nursing assistant even if the CNA has a different assignment. A nurse was busy and needed help turning a patient, however, the nursing assistant assigned to her was busy. When she asked another assistant, she was told “no” by another nurse. That was “her” assistant. Some nurses will change their assignment to make sure they care for “their” physician’s patients. I think we can all recall someone in our workspace who exhibits territorial tendencies, hopefully not as extreme as in some of these examples. However, when we examine the issue of territorialism at work, it’s actually ridiculous, isn’t it? Why then? Why are some people so territorial? Why are some people so territorial? People who “mark their territory” do so as a protective mechanism. By being territorial, it gives them a sense of control or perceived power over others. These territorial behaviors may stem from an inner insecurity or experience where they didn’t have control in their past. Also, think about the environments we work in – the life and death situations; the unpredictability of our healthcare environments. We experience more stress in healthcare than any other industry. By controlling which computer and chair they use, they are decreasing the stress of unpredictability. However, it’s still not okay. Hoarding linens and equipment is NOT the best coping mechanism! Some people are hyper myopic and only focus on what’s best for them. They come to work with a goal of making difficult work as easy as possible for them. However, it’s important to understand that human beings are myopic by default. We see the world through our own eyes and make decisions based on what’s best for our personal survival. However, as we’ve evolved over time, we recognize that while our innate drive is to survive, to live a fulfilling life requires us to flip the switch and go out of our way to do good for others. That’s why many of us become nurses – to make a difference in the lives of other people. 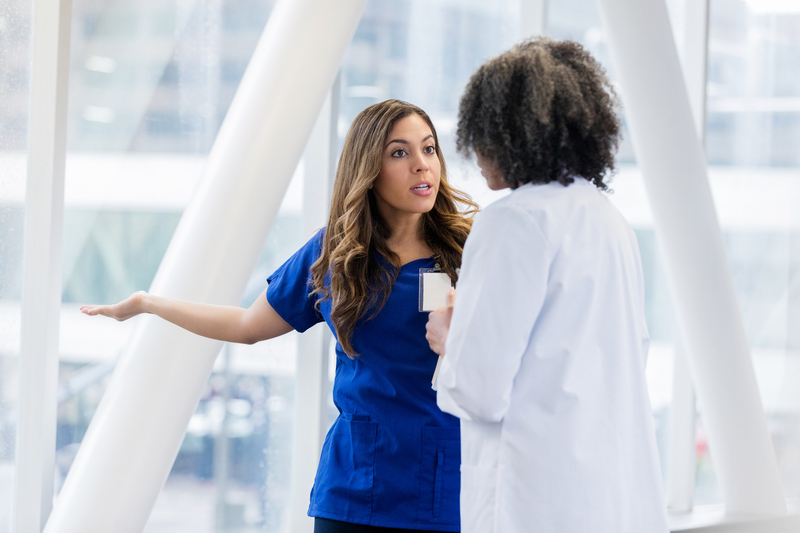 However, some nurses, are still making decisions based on what’s best for them – they want convenience, routine, predictability in an unpredictable world. So, they hoard equipment, people, and other things because doing so is what’s best for them. How do we deal with a territorial coworker? The topic of territorial coworkers comes up during every workshop I conduct. It’s so pervasive, yet when asked, “How do you deal with it?” – nobody really knows how or gives a good answer. Although tempting, these responses don’t necessarily address the issue and they actually close the door to any conversation. Asking someone to show a receipt for a computer will produce a negative, defensive reaction, and will open the door for an argument. A better response would be to put your curiosity hat on. When you approach a situation with curiosity, you’re opening the door for a conversation and addressing the territorial behavior in a more professional manner. Make sure you also include the “so what” factor. What’s the harm? It’s hurting the team. It’s hurting workflow, which ultimately, hurts the team. It’s hurting relationships, which ultimately hurts the team. And, everything we do as a team, impacts a patient, who is someone’s mom, dad, husband, wife, son, daughter, grandchild, bestie, auntie, etc. You get it. When asked if Cheryl got fired for throwing the cup of water on the nurse who wouldn’t get out of “her chair”, the 2 nurses who shared that story, looked at me like I was speaking a foreign language. Of course not. Everyone knows not to sit in Cheryl’s chair! Come on nurses. We need to do better. Please share your comments below about your experiences with territorial nurses and be sure to click here to sign-up to receive additional resources. Have dealt with people hiding things (in the past). Different staff now, but will look out for this. Great reminder. Thanks Cindy. Isn't it sad we have to worry about our coworkers hiding things from us?? Thanks for taking the time to comment. Glad you appreciated the reminder! Thank you for putting words to how we can better respond in these situations! You're welcome Lori!! It's amazing how common territorial behavior is!!! When someone claims their "stuff", it hurts the team and ultimately the patients we serve.